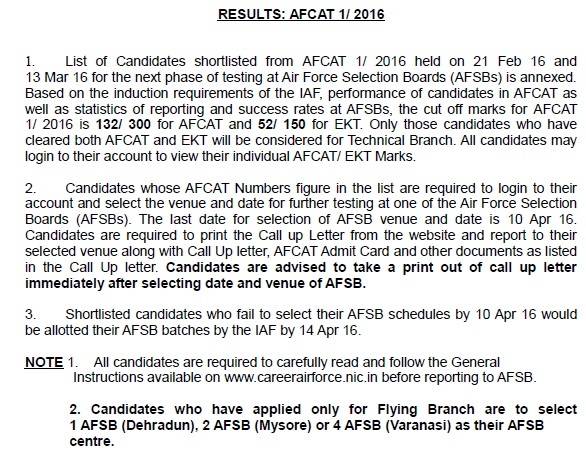 Latest News (01.04.2016): Indian Air Force (IAF) had announced the result of AFCAT 01/2016 on 01 Apr 2016. The test was held on 21 Feb and 13 March 2016. Now AFCAT Results had been announced. 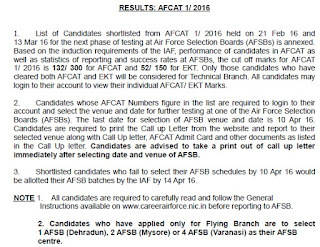 Along with the list of shortlisted candidates, AFCAT had also released the cut off marks used to shortlist candidates. AFCAT Cut off marks : 132/300 and 52/150 (EKT). Those who had qualified the test will have to appear for Intelligence test, Psychometric test, GD, Interview or CPSS depending on branch. To check AFCAT Result 2016: Click on the below given link.